made for informing the field with existing and future educational research (e.g. Issenberg et al., 2011). ECAS in health care education. apply ECAS in health care education. “re-designing learning contexts” of which ECAS are a part. see Luckin, 2010: p. 94). ideas about scaffolding (Wood et al., 1976). rather than competitive, interactions (Johnson & Johnson, 1989). 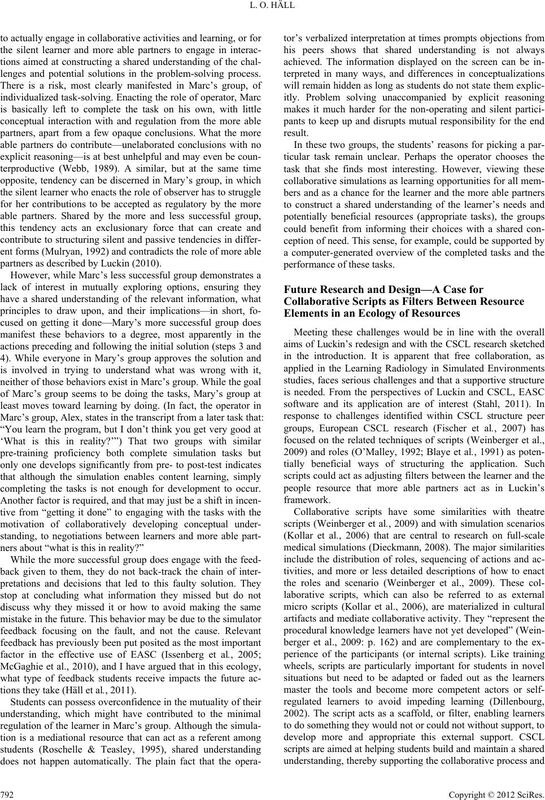 resource for ecology researchers focusing on peer interactions. role of the more able partner. the teacher-student ratio (Dubrowski & MacRae, 2006). negotiation between silent learner and more able partner? during an hour of simulation training on the topic of radiology. study is presented in Table 1.
simulator include replication of standard and incorrect views. experimented on in an improvised manner. ing how to manage things. ECAS and conventional alternatives (Häll et al., 2011). back, and finish; and scores on the initial and final solutions. tion and verbal space, respectively. cessfulness led to the choice of one snapshot from each group. sessions. The snapshots were transcribed in more detail. equally, with one participant less verbal (i.e., relatively silent). counts of contributions. All names are fictitious. 15, while Marc stays at 7. Proficiency test scores and development of group members. differences in development between groups. graphic images and to operate the simulator (scene and objects). cient solution elicits only visual and numerical feedback. discussion during the training session. mation (6), which she receives from Eli (7). Mary’s group picking a task. 3 Eli Canine. (3) Lower canine. 5 TeacherThen you choose which task to do, yeah. 6 Ava Should we try this one? Mary’s group taking the initial radiograph. 8 Eli Here it is. 9 Ava Pull back a bit. 14 Ava Is this how you do your shots? 16 Eli Yes. (3). Looks like it. Step 3. Comparing radiographs and finding a solution. gesting how to re-position the camera (26). task and receive feedback (40). Mary’s group comparing radiographs and finding a solution. 19 Mary Yeah, it’s distal. 22 Eli No, it is more mesial. Isn’t the one on the right more …? 23 Mary No, no, but this is the premolar here. take THAT one more frontal. from the front exactly. When the image is on the exact spot. 29 Eli There. (1) It is taken more distal. 30 Ava Yes. (1) Then it’s ortoradial to four then. 31 Mary Feels this not a canine shot? It [must] be a premolar shot. see in the beam direction [above there]. Step 4. Dealing with feedback and correcting the solution. The next excerpt deals with feedback on an incorrect solution. have accounted (49), and again receives support from Ava (50). Mary’s group dealing with feedback and correcting the solution. 44MaryMore from abo-, more above they took it. 51MarySo they took it quite a bit [from above]. 52Eli [Or no they] haven’t become shorter at all. 53MaryThey [have become rather] short in comparison to this image. 55Eli Yeah. I suppose they have. 56Mary[This one sure has backed up]. 57Ava [But try, try to put it] so you see where it should have been. (2) Put the white on the blue there. 61Eli Way up, they went. 62AvaYeah, that’s how they take them, of course. questions (“Can’t you change …”) and directives (“Canine. throughout the production of the initial radiograph. group engaging in the same task in the same anatomical area. button and begins the task (7). Marc’s group picking a task. take that. No, not that one either. 5MarcOh yeah. ((Laughing)). Analyze beam direction. 6Alex You’ve got it up there. support from Hera (9), repeats her words, and picks this action. Marc’s group taking the first radiograph. 8 MarcThen, let’s just see, observe direction. (2). Mm. Marc’s group comparing radiographs and finding a solution. 12Alex It’s more superior (1) and (1) eh [mesial]. 15 Marc Yes, distal, yeah. (1) Exactly. Marc’s group dealing with feedback and correcting the solution. 23 Hera Neat! Did you get a beep right away? 25 Hera He got you there, sourpuss! and gets acknowledgement from Hera (“Mm, looking good”). underlying logic of individual competition. role of an operator being observed and, insufficiently, regulated. tion between the silent learner and more able partners. portunities for the adjustment of these ecologies of resources. lenges by adjusting the ecologies through filtering scripts. lenges and potential solutions in the problem-solving process. partners as described by Luckin (2010). completing the tasks is not enough for development to occur. tions they take (Häll et al., 2011). gumentations, and mutual-regulation (Weinberger et al., 2009). the ECAS ecology explored in this paper. its implication for the final solution. must ensure that the arguments are based on sound evidence. need to be built into the simulator. that vary between learners as well as within learners over time. relevant area of future research. correct poor collaborative skills (Luckin, 2010: p. 70). sity funded by the Wallenberg Global Learning Network. Aronson, B., Blaney, N., Stephan, C., Sikes, J., & Snapp, M. (1978). The jigsaw classroom. Beverly Hills, CA: Sage. century. New England Journal o f Medicine, 355, 2695-2696. Aggarwal, R., Grantcharov, T., Moorthy, K., Hance, J., & Darzi, A.
possible future directions. Medical Education, 40, 254-262.
ductive small groups. 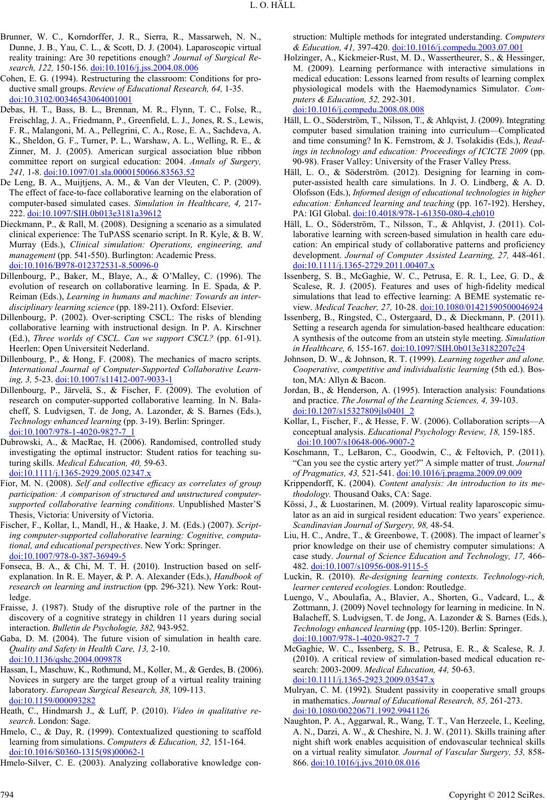 Review of Educational Research, 64, 1-35. F. R., Malangoni, M. A., Pellegrini, C. A., Rose, E. A., Sachdeva, A. De Leng, B. A., Muijtjens, A. M., & Van der Vleuten, C. P. (2009). clinical experience: The TuPASS scenario script. In R. Kyle, & B. W.
management (pp. 541-550). Burlington: Academic Press. evolution of research on collaborative learning. In E. Spada, & P.
disciplinary learning science (pp. 189-211). Oxford: Elsevier. (Ed. ), Three worlds of CSCL. Can we support CSCL? (pp. 61-91). Dillenbourg, P., & Hong, F. (2008). The mechanics of macro scripts. Technology enhanced learning (pp. 3-19). Berlin: Springer. turing skills. Medical Education, 40, 59-63. Thesis, Victoria: University of Victoria. tional, and educational perspectives. New York: Springer. interaction. Bulletin de Psychologie, 382, 943-952. Gaba, D. M. (2004). The future vision of simulation in health care. Quality and Safety in H e a lth Care, 13, 2-10. Hassan, I., Maschuw, K., Rothmund, M., Koller, M., & Gerdes, B. (2006). laboratory. European Surgical Research, 38, 109-113.
learning from simulations. Computers & Education, 32, 151-164.
puters & Education, 52, 292-301.
ings in technology and education: Proceedings of ICICTE 2009 (pp. 90-98). Fraser Valley: University of the Fraser Valley Press. puter-assisted health care simulations. In J. O. Lindberg, & A. D.
development. 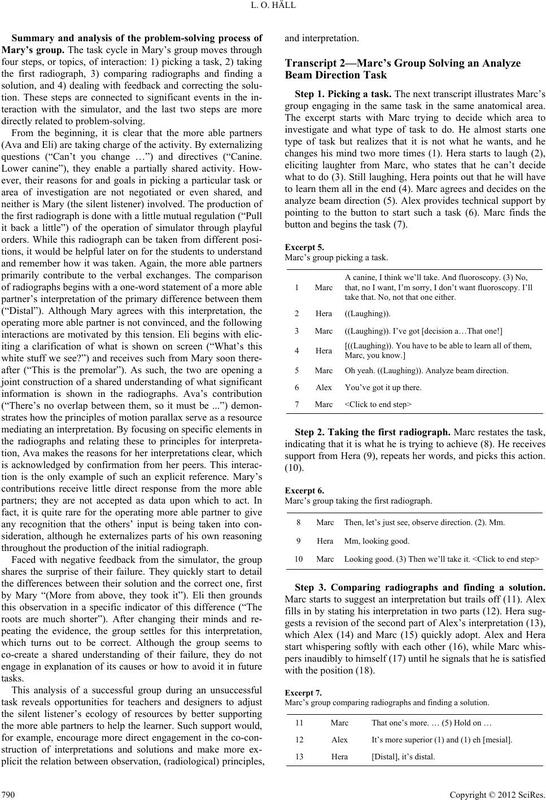 Journal of Computer Assisted Learning, 27, 448-461. Issenberg, B., Ringsted, C., Ostergaard, D., & Dieckmann, P. (2011). Johnson, D. W., & Johnson, R. T. (1999). Learning together and alone. ton, MA: Allyn & Bacon. and practice. 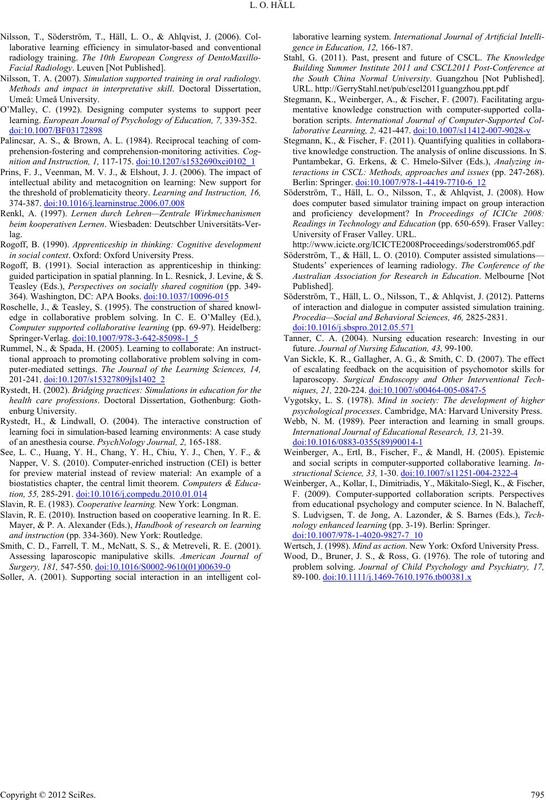 The Journal of the Learning Sciences, 4, 39-103.
conceptual analysis. Educational Psychology Review, 18, 159-185. Koschmann, T., LeBaron, C., Goodwin, C., & Feltovich, P. (2011). thodology. Thousand Oaks, CA: Sage. lator as an aid in surgical resident education: Two years’ experience. Scandinavian Journal of Surgery, 98, 48-54.
learner centered ecologies. London: Routledge. Zottmann, J. 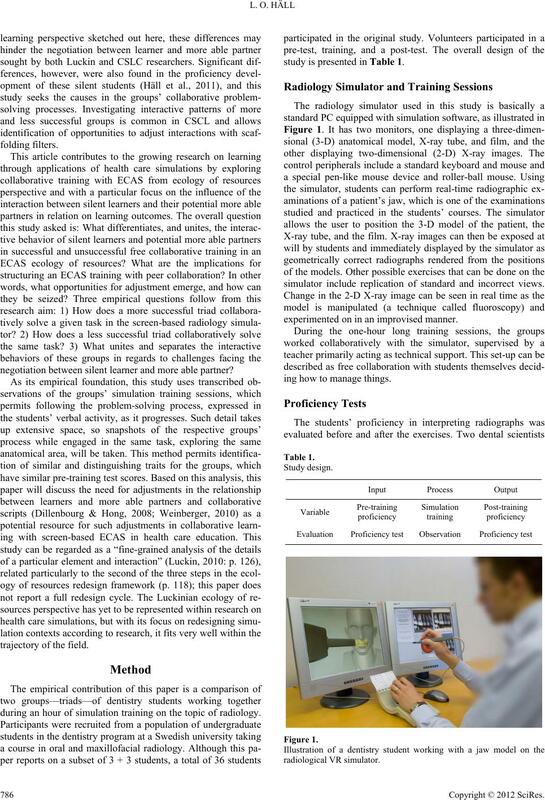 (2009) Novel technology for learning in medicine. In N.
Technology enhanced learning (pp. 105-120). Berlin: Springer. McGaghie, W. C., Issenberg, S. B., Petrusa, E. R., & Scalese, R. J.
search: 2003-2009. Medical Education, 44, 50-63.
in mathematics. Journal of Educational Research, 85, 261-273. Facial Radiology. Leuven [Not Published]. Nilsson, T. A. (2007). Simulation supported training in oral radiology. learning. European Journal of Psych ology of Education, 7, 339-352.
in social context. Oxford: Oxford University Press. guided participation in spatial planning. In L. Resnick, J. Levine, & S.
of an anesthesia course. PsychNology Journal, 2, 165-188. Slavin, R. E. (2010). Instruction based on cooperative learning. In R. E.
and instruction (pp. 334-360). New York: Routledge. Smith, C. D., Farrell, T. M., McNatt, S. S., & Metreveli, R. E. (2001). gence in Education, 12, 166-187.
the South China Normal University. Guangzhou [Not Published]. tive knowledge construction. 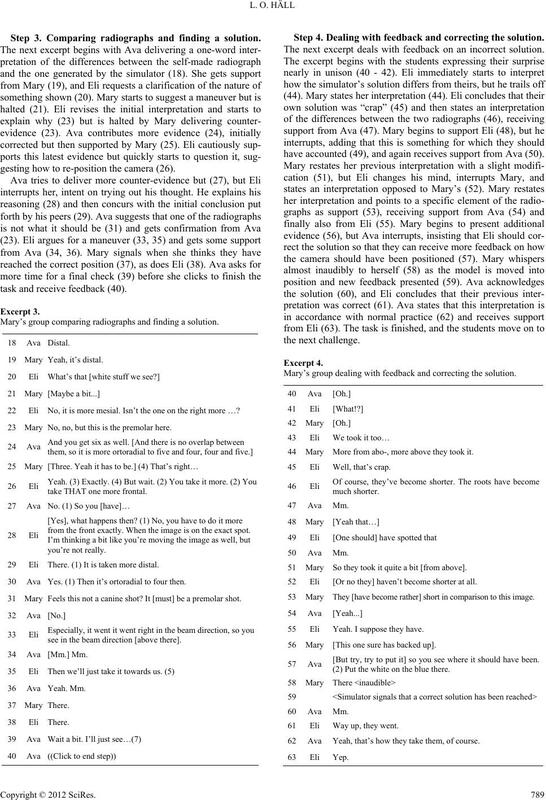 The analysis of online discussions. In S.
teractions in CSCL: Methods, approaches and issues (pp. 247-268). University of Fraser Valley. URL. 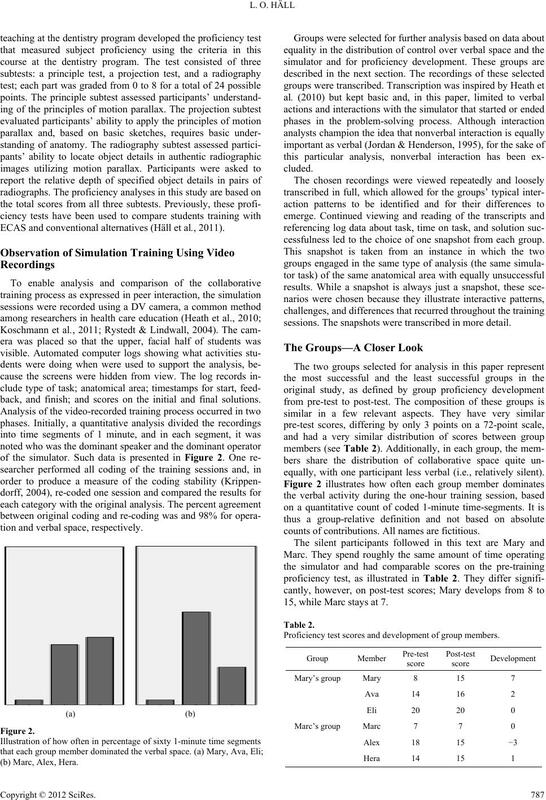 of interaction and dialogue in computer assisted simulation training. Procedia—Social and Behavioral Sciences, 4 6, 2825-2831.
future. 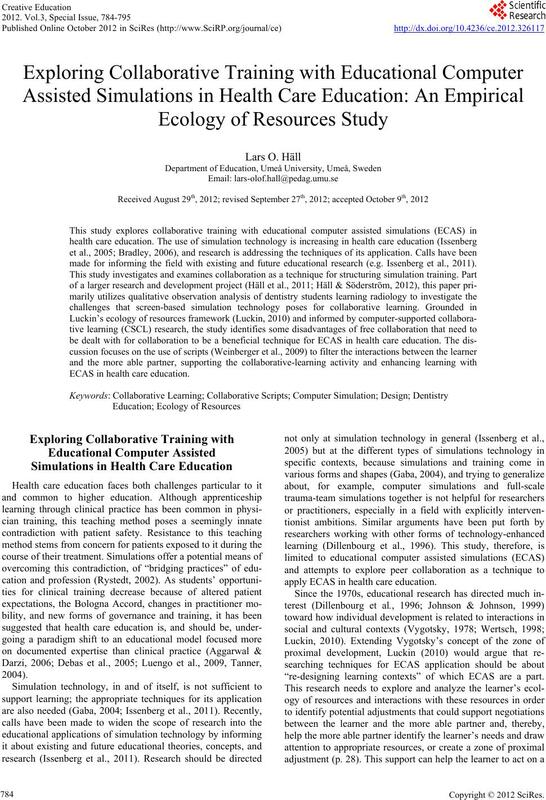 Journal of Nursing Education, 43, 99-100. Webb, N. M. (1989). Peer interaction and learning in small groups. 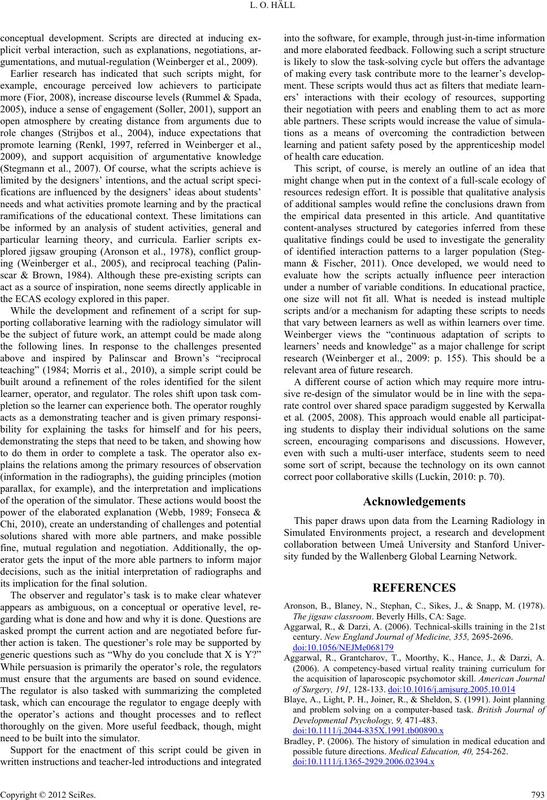 International Journal of Educational Research, 13, 21-39.
nology enhanced learning (pp. 3-19). Berlin: Springer.